Background and purpose Prompt recanalization of cerebral arteries in patients diagnosed with acute ischemic stroke is known to be associated with a better clinical outcome. The aim of this study was to present our initial experience regarding the efficacy and safety of the Solitaire FR as a revascularization device. Methods 56 consecutive patients presenting with acute ischemic stroke underwent intra-arterial therapy using the Solitaire FR revascularization device. Immediate angiographic results and early clinical outcomes are presented. Results Solitaire FR was successful in achieving recanalization in 50 out of 56 patients (89%) with a final Thrombolysis in Cerebral Infarction score ≥2b. Five out of 56 patients had procedure related complications: two asymptomatic subarachnoid hemorrhages, two thromboembolic events and one symptomatic intracranial hemorrhage (PH2). Thirty patients (53.5%) demonstrated at discharge a National Institutes of Health Stroke Scale Score of ≤1 or an improvement of at least 10 points from baseline, and 26 patients (46%) had a modified Rankin Score ≤2. Conclusions Solitaire FR is successful in achieving a high rate of arterial recanalization with a low complication rate. The Solitaire FR is a promising thrombectomy tool with a high degree of effectiveness, safety and ease of use. Prompt recanalization of an occluded cerebral artery in the setting of acute ischemic stroke (AIS) is correlated with good clinical outcome and reduced mortality.1 Intravenous administration of fibrinolytic drugs (recombinant tissue plasminogen activator (rt-PA)) within 4.5 h of stroke onset is the most common therapy for AIS in the occidental world.2 On the other hand, several studies have demonstrated an improvement, in terms of recanalization rate and clinical outcome, with the use of mechanical thrombectomy devices.3 In spite of the encouraging results reported by various types of mechanical devices, none are accepted worldwide as a standard recanalization tool. The aim of the present study is to report the immediate results of a series of 56 consecutive patients treated at our institution using the Solitaire FR device, in the setting of AIS. The Solitaire FR device in the European Union is CE ‘Communauté Européenne’ certified. Its use in our stroke unit for thrombectomy was approved by the members of our multidisciplinary stroke team and given that this is a retrospective study, no ethics approval was necessary. Patients were examined at admission by a senior stroke neurologist who assessed the severity of the neurological deficit using the National Institutes of Health Stroke Scale Score (NIHSS). Patients with an NIHSS <8 for the anterior circulation were not included and neither were patients with spontaneous NIHSS improvement. Clinical evolution was evaluated daily during hospitalization using the NIHSS and modified Rankin Score. Patients were studied in the acute phase with MRI in order to identify the extent of the ischemic lesion, with the exception of one patient with a pacemaker who underwent CT imaging. Diffusion weighted imaging (DWI) was used for assessing the extent of the ischemic lesion. MR angiography was used to identify and locate the site of vessel occlusion. T2 and FLAIR weighted imaging was used to determine the timing of the ischemic lesions. Perfusion imaging was used to identify the contribution of the collateral circulation to the ischemic zone. For patients with anterior circulation strokes, the Alberta Stroke Program Early CT (ASPECT) score,4 calculated on DWI,5 was used to assess the ischemic core. Only patients with an ASPECT score ≥5 were candidates for treatment. All inclusion/exclusion criteria for this study are summarized in box 1. In accordance with our institutional stroke protocol (table 1), patients presenting within 4.5 h from symptom onset, secondary to an isolated M1 occlusions, were initially treated with intravenous fibrinolysis (rt-PA 0.9 mg/kg). Thrombectomy was performed as a rescue therapy if clinical improvement (NIHSS improvement of at least 4 points) was not achieved within 60 min from the intravenous injection. 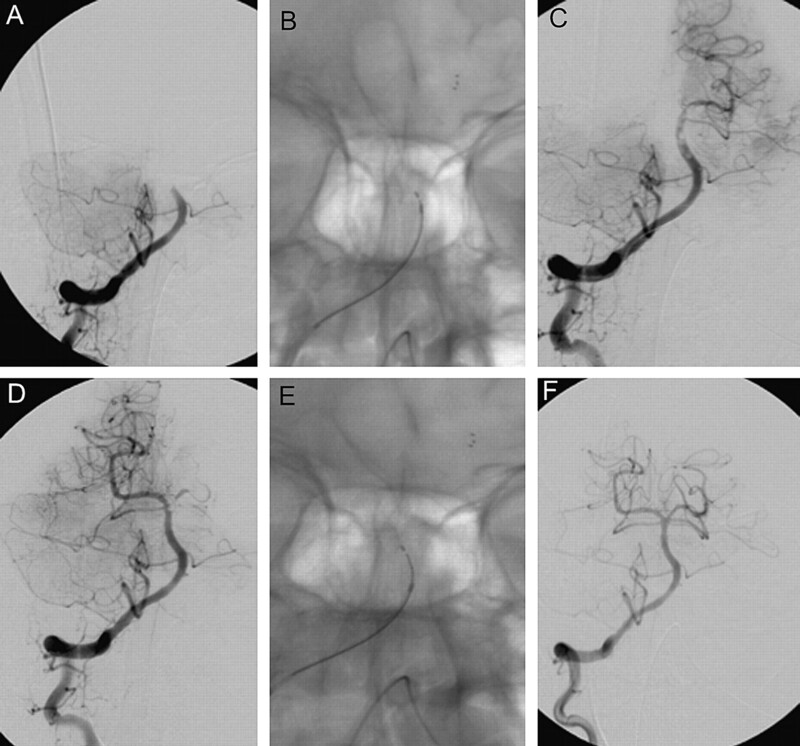 The efficacy of intravenous therapy alone in internal carotid artery (ICA) occlusions is limited, as demonstrated by Linfante and colleagues.6 Therefore, thrombectomy was carried out in a ‘combined approach’ if the patient presented with ICA or tandem occlusions within 4.5 h. Patient presenting between 4.5 and 6 h with anterior circulation strokes were treated with thrombectomy alone. For patients with posterior circulation strokes, a combined approach was performed up to 24 h, depending on the extent of the ischemic lesions and the clinical status. In the posterior circulation, the exclusion criteria were based on the radiological appearances on DWI. Extensive brainstem lesions—for example, bilateral complete involvement of the pons or diencephalic structures—were the main exclusion criteria. The Solitaire FR revascularization device (EV3, Irvine, California, USA) is a stent based thrombectomy system with a closed cell design and a longitudinal split section (figure 1). The device is delivered through a standard microcatheter (inner lumen diameter of 0.021 inches or 0.027 inches) via a 0.016 inch nitinol pushwire. The unique Solitaire stent based design features allow for dual functionality: firstly, it acts as a temporary intracranial bypass providing immediate flow restoration through the thrombus; and secondly, it acts as a clot retriever, trapping thrombus into its cells allowing for clot removal. It received CE Mark approval as a flow restoration device. Solitaire FR revascularization device is a self-expanding, nitinol system with closed cells and a longitudinal split, overlap design. All procedures were performed via a femoral artery approach under general anesthesia. For the anterior circulation, an 8 Fr or 9 Fr Merci balloon guiding catheter (Concentric Medical, Mountain View, California, USA) was introduced through a femoral sheath into the appropriate carotid artery. For the posterior circulation, a 6 Fr Envoy guiding catheter (Cordis, Miami Lake, Florida, USA) was placed into the dominant, or navigable, vertebral artery. A 0.021 inch internal diameter microcatheter Prowler Select Plus (Cordis) or Vasco 21 (Balt, Montmorency, France) was navigated distal to the point of occlusion over a 0.014 inch steerable microwire. A microcatheter angiographic run was then carried out in order to confirm and define the vasculature distal to the thrombus. The Solitaire FR was then introduced through the microcatheter and the device deployed across the occluding thrombus. The microcatheter distal marker was positioned at the exact level of the proximal marker of the stent. An intravenous bolus of 1000 IU of standard heparin was administered at this time. On Solitaire FR deployment, an angiographic control was performed in order to evaluate the correct placement and expansion of the device. After the angiographic run, the Solitaire FR was maintained in place for a few minutes (3–7 min) to allow device expansion. After this time, the fully deployed Solitaire FR and the delivery microcatheter were gently pulled back together and recovered through the guiding catheter. The Solitaire FR was at no point completely or partially resheathed. During the retrieval, the balloon guide catheter was inflated to suspend anterograde flow. Manual aspiration with a 50 ml syringe was performed through the hemostatic valve during the retrieval in order to reverse the flow and to aspirate clot debris eventually present in the lumen of the guide catheter. A maximum of five passes were performed using the device, if necessary (figure 2). The integrity of the stent was consistently checked after every pass. No additional devices were used with the Solitaire FR and it was not used in combination with intra-arterial rt-PA in any case. (A) A frontal angiogram showing a mid-third basilar artery (BA) occlusion. (B, C) Solitaire FR deployed through the thrombus and allowing partial opacification of the BA. (D) Following the first pass of the Solitaire FR, the left posterior cerebral artery (PCA) remained occluded. (E, F) A second pass in the left PCA resulted in complete recanalization of the BA and its branches (Thrombolysis in Cerebral Infarction 3). From July 2009 to July 2010, 56 consecutive patients (24 men and 32 women) aged 26–91 years (median 67.5, mean 67) were treated with Solitaire FR in the setting of AIS (table 2). The target vessel was the middle cerebral artery (MCA) in 27 patients. In 14 patients the occlusion involved the ICA, in nine the intracranial carotid bifurcation (carotid T) and in five both the cervical carotid artery and carotid T or MCA (tandem occlusion). In 15 patients, the target artery was the basilar artery (BA). In all patients, the presenting Thrombolysis in Cerebral Infarction (TICI)7 perfusion category was 0. The mean presenting Glasgow Coma Scale, available for 35 patients, was 11 (median 11; range 3–15). The mean presenting NIHSS, available for 49 patients, was 15.8 (median 16; range 7–26). Mean time from stroke symptom onset to presentation to the emergency department was 2 h and 49 min (median 124 min; range 45–630 min). Mean time from presentation to the emergency department to the baseline angiogram was 2 h and 27 min (median 145 min; range 40–450 min). The Solitaire FR was able to obtain complete vessel recanalization with normal perfusion of the involved arterial territory (TICI 3) in 46 patients (82%). A TICI perfusion of ≥2b was obtained in 50 patients (89.2%). The highest rate of TICI ≥2b was obtained in patients with MCA occlusion (92.5%; 25/27 patients). In five cases (8.9%), Solitaire FR failed to recanalize the occluded vessel and to restore antegrade flow beyond the point of occlusion, with a final TICI score of 0. Four of these cases (80%) had undergone combined therapy. The occlusion sites were localized in the carotid T for three patients and in the BA and the M1 for the other two. A TICI score of 2a was obtained in a case of BA occlusion. Partial recanalization (TICI 2b) was obtained in four patients (7%). In these cases the occlusion was localized twice in the MCA and once in the BA and the carotid T.
The mean number of passes performed per procedure was 2 (median 2; range 1–5). Mean time needed for recanalization of the target artery, calculated from the baseline angiogram, was 37 min (median 27; range 4–236) (table 3). We observed vasospasm following clot retrieval in 18 of 56 patients (32%), which resolved after intra-arterial injection of nimodipine (intra-arterially 2 mg in 10 ml). Of the 11 patients treated with mechanical thrombectomy alone, 10 achieved a TICI score ≥2b. Similarly, in 16 of 17 patients treated with mechanical thrombectomy following failure of intravenous treatment (rescue thrombectomy), a TICI score ≥2b was obtained. In the five cases of tandem occlusions, the proximal obstruction was in three cases secondary to a thromboembolus and in two secondary to an atherosclerotic plaque. In the thromboembolism cases, the guide catheter was advanced past the proximal occlusion while aspirating. In two cases of a significant atherosclerotic stenosis, the catheter was advanced distal to the proximal occlusion following balloon angioplasty. The distal intracranial thrombosis was then treated to re-establish the cerebral circulation as soon as possible. In one of these patients, the carotid stenosis had to be treated acutely to maintain adequate cerebral perfusion. In the other patient, treatment was carried out 2 weeks following the acute phase. A TICI score of 3 was obtained in all cases except one. The overall rate of procedure related complication was 8.9% (5/56 patients), as detailed below. Angiographic evidence of thromboembolic events occurred in two cases (3.4%). The first thromboembolic complication occurred during basilar artery clot retrieval through a right vertebral artery approach. Thrombus fragmentation was the suspected mechanism of a subsequent right posterior inferior cerebellar artery occlusion that resulted in a cerebellar infarction. 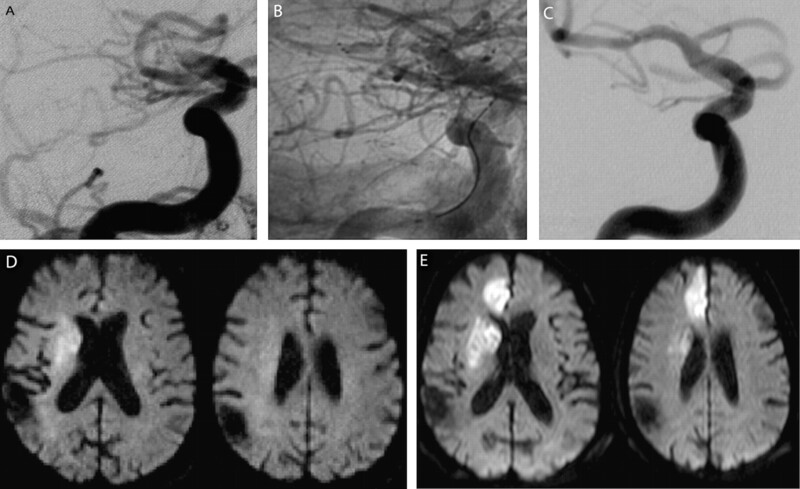 The second thromboembolic event occurred during clot removal in a case of terminal carotid and MCA thrombosis and consisted of an anterior cerebral artery occlusion (figure 3). A thromboembolic occlusion of the right anterior cerebral artery (ACA) occurred during clot removal from the ipsilateral carotid termination. (A) Initial frontal angiogram showing a right terminal carotid occlusion. (B) Solitaire FR deployed through the thrombus allowed immediate flow restoration. (C) After Solitaire FR retrieval, the thrombus is removed from the occlusion site. (D, E) Diffusion weighted imaging before and after the procedure shows an extension of ischemic lesion in the right ACA territory. Two procedure related but asymptomatic subarachnoid hemorrhages were recorded (3.5%). A postprocedural intracerebral hemorrhage (ICH) PH28 (1.7%; 1/56 patients) occurred in a patient with a left M1–M2 occlusion. In this case, thrombectomy was performed after failure of intravenous fibrinolysis. Four passes of the device were performed and TICI 2b was achieved 7 h and 20 min after symptom onset. The final procedural angiographic control did not show contrast medium extravasation and the postoperative CT scan did not demonstrate any hemorrhagic event. At 24 h, the control CT showed a large intraparenchymal hematoma in the left MCA territory. The hematoma did not require surgical evacuation and at discharge, the clinical score of the patient was stable (NIHSS 20). Four patients died (7.14%; 4/56 patients) during the initial postprocedural hospitalization. None of the deaths were directly related to the intervention or the device. The average postoperative NIHSS score at awaking (available for 24 patients) was 10.5 (median 9; range 0–25). NIHSS calculated at discharge (available for 48 patients; 65.5%) was, on average, 7 (median 3.5; range 0–26). At discharge, 30 patients (53.5%) presented with an NIHSS of ≤1 or an improvement of at least 10 points from baseline, and 26 patients were discharged with a modified Rankin Score of ≤2. Improved clinical outcome was most frequent in patients with M1 occlusions (16 of 27 patients: 59.2%). Worse clinical outcomes was noted for patients with BA occlusions; only five of 15 patients (33.3%) had a good clinical outcome at discharge. Several studies have demonstrated the efficacy of a combined intravenous and endovascular approach in the treatment of AIS compared with intravenous therapy alone.9 10 While the intravenous administration of fibrinolytic drugs is easy to perform and to reproduce, the feasibility of the endovascular mechanical approach is widely variable, depending on different institutional protocols, operators and devices used. Numerous endovascular techniques and thrombectomy devices have been used over the years. Clinical experiences in using MERCI Retriever device (Concentric Medical) have been extensively reported. In the Multi-MERCI trial,13 a recanalization rate of 69.5% (91/131 patients) was obtained when thrombectomy was associated with postadjunctive intra-arterial administration of fibrinolytic drugs. Symptomatic ICH occurred in 9.8% of patients (16/131 patients) and clinically significant intraprocedural complications were reported in 5.5% of cases (9/131 patients). The mean number of passes performed per intervention was 2.9. The results of this series, compared with our results, show a lower rate of target vessel recanalization (65.5% vs 89.2%), a higher number of passes per procedure (2.9 vs 2), a higher rate of clinically significant intraprocedural complications and symptomatic hemorrhages. The investigators from the Penumbra Pivotal Stroke Trial14 reported on 125 acute stroke patients treated with the Penumbra System (Penumbra Inc, Alameda, California, USA). In this series, 81.6% of the target vessels were recanalized to TIMI 2–3. Eighteen procedural events in 16 patients (12.8%) were reported. Total mortality was 32.8%, and 35 patients (28%) were found to have ICH on 24 h CT, of which 14 (11.2%) were symptomatic. At 90 days, 25% of the patients achieved a modified Rankin Scale score of ≤2. Paradoxically, for a proximal thrombectomy device (compared with a distal device) the Penumbra System demonstrated a higher rate of ICH compared with our study. Moreover, the 90 day follow-up of the Penumbra trial cohort (25% of patients with a modified Rankin Scale score of ≤2) did not correlate with the high incidence of target artery recanalization (81.6%) reported. This is most likely secondary to the TIMI scoring system used by the investigators to evaluate the degree of recanalization which is not directly related to the degree of arterial bed reperfusion distal to the occlusion and hence clinical recovery. Intracranial self-expanding microstents have been used successfully as temporary or permanent endovascular bypass in the invasive management of AIS.15 With this technique the stent deployed at the point of vessel occlusion expands, displacing circumferentially the thrombus and allowing flow restoration. The re-establishment of flow through the occlusion site promotes immediate dissipation of prothrombotic factors. At the same time, the restored arterial flow allows for thrombolytic medications to be in contact with thrombotic material trapped within the mesh of the stent and against the arterial wall. Recently, Castano et al16 reported their experience using the Solitaire AB stent (EV3), the version of the Solitaire stent designed for aneurysm remodeling, used as a revascularization device in the treatment of 20 patients presenting within 8 h of stroke symptom onset. The authors described a procedural technique very similar to what we use. Although they only included anterior circulation stroke cases, the results are comparable with ours in terms of recanalization rate (90% vs 89.2%), early good clinical outcome (50% vs 53.5%) and number of device passes performed per procedure (1.4 vs 2). In our experience, the Solitaire FR was used as the primary recanalization device in a consecutive series of 56 AIS patients. From a technical point of view, the Solitaire FR was easily navigated to the occlusion point and its deployment across the thrombus was obtained in every case at first attempt. No device fractures were recorded in our series. One can imagine that retrieval of the stent fully deployed would be dangerous in term of vessel damage. We did not experience any cases of vessel dissection. Jahan,17 on a swine model, demonstrated no problems angiographically and microscopically, with vessel dissection following use of the Solitaire FR. However, he observed vasospasm, as in a number of our patients, following clot retrieval. Following the off-label use of the Solitaire FR in the M2 and M3 segments to retrieve distal emboli secondary to the initial thrombectomy, we observed two cases of asymptomatic subarachnoid hemorrhage. One symptomatic case of ICH (PH2) was reported. Furthermore, the most important was the use of a balloon mounted guiding catheter for thrombus removal. On multiple occasions, thrombus was found in the 50 ml syringe used for manual aspiration during device retrieval. It is possible that the stent in these cases just facilitated clot retrieval by displacing and mobilizing the thrombus. This was a single center, non-randomized, retrospective study with a small number of patients. But this was a consecutive series and all patients from July 2009 to July 2010 were included. In our results, we did not differentiate between anterior and posterior circulation lesions. However, studies have shown that outcome in the posterior fossa is not as favorable. The true indicator of a successful intervention or therapy is good long term clinical outcome. In this article, we have reported technical notes and data regarding immediate clinical results using the Solitaire FR. We plan to follow-up these patients and correlate their long term clinical evolution with the initial MR imaging data, in particular with perfusion and diffusion sequences. Based on our initial experiences with the Solitaire FR thrombectomy system, we postulate that it is a valid tool in the treatment of AIS, providing effective, safe and rapid arterial recanalization. Our limited initial results must be followed-up and compared with larger series and long term clinical outcome data. Prompt recanalization of an occluded cerebral artery in the setting of acute ischemic stroke (AIS) is correlated with good clinical outcome and reduced mortality. Intravenous administration of fibrinolytic drugs is the most common therapy for AIS. Mechanical thrombectomy devices compared with intravenous fibrinolysis, provide an improved recanalization rate and clinical outcome. The Solitaire FR revascularization device is a stent based thrombectomy system with a closed cell design and a longitudinal split section. In 56 consecutive AIS patients, the Solitaire FR achieved a high rate of arterial recanalization with a low complication rate.
. The impact of recanalization on ischemic stroke outcome: a meta-analysis. Stroke 2007;38:967–73.
. Tissue plasminogen activator for acute ischemic stroke: The National Institute of Neurological Disorders and Stroke rt-PA Stroke Study Group. N Engl J Med 1995;333:1581–7.
. Endovascular approaches to acute stroke, part 1: Drugs, devices, and data. AJNR Am J Neuroradiol 2009;30:649–61.
. Imaging of the brain in acute ischaemic stroke: comparison of computed tomography and magnetic resonance diffusion-weighted imaging. J Neurol Neurosurg Psychiatry 2005;76:1528–33.
. Clinical and vascular outcome in internal carotid artery versus middle cerebral artery occlusions after intravenous tissue plasminogen activator. Stroke 2002;33:2066–71.
. Trial design and reporting standards for intra-arterial cerebral thrombolysis for acute ischemic stroke. Stroke 2003;34:e109–37. The IMS II Trial Investigators. The Interventional Management of Stroke. Stroke 2007;38:2127–35.
. Intra-arterial prourokinase for acute ischemic stroke: The PROACT II study: a randomized controlled trial. JAMA 1999;282:2003–11.
. Interaction, efficiency, and complications in vivo mechanical thrombectomy for acute ischemic stroke: thrombus-device. Stroke 2006;37:3019–24.
. Comparison of intravenous alteplase with a combined intravenous–endovascular approach in patients with stroke and confirmed arterial occlusion (RECANALISE study): a prospective cohort study. Lancet Neurol 2009;8:802–9.
. MERCI trial mechanical thrombectomy for acute ischemic stroke: final results of the multi MERCI trial. Stroke 2008;39:1205–12. The Penumbra Pivotal Stroke Trial Investigators. The penumbra pivotal stroke trial: safety and effectivenes of a new generation of mechanical devices for clot removal in intracranial large vessel occlusive disease. Stroke 2009;40:2761–8.
. Stent-assisted Intracranial Recanalization for Acute Stroke: Early Results. Neurosurgery 2006;58:458–63.
. Mechanical thrombectomy with the solitaire AB device in large artery occlusions of the anterior circulation. Stroke 2010;41:1836–40.
. Solitaire flow-restoration device for treatment of acute ischemic stroke: safety and recanalization efficacy study in a swine vessel occlusion model. AJNR Am J Neuroradiol 2010;31:1938–43. Competing interests AB is a consultant for Boston Scientific, EV3 and Microvention.